Suffield Town Hall is located at 83 Mountain Road, Suffield, CT 06078; phone: 860-668-3880. 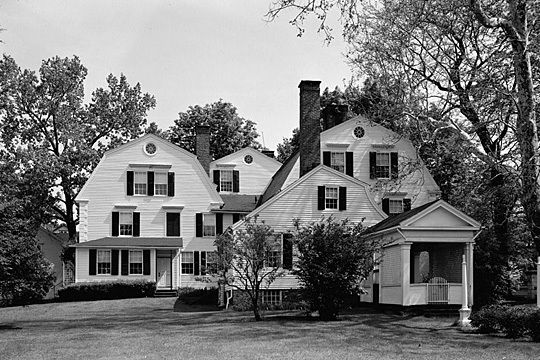 Photo: Burbank-Hathaway House, Main Street, Suffield, CT, photographed in 1958 by Robert J. Kelley, Historic American Buildings Survey [HABS CT-240], memory.loc.gov, accessed January 2011. The various sections of this house were built in three periods: proabably late 17th century, middle 18th century, and late 18th century. About 1670, settlers from Springfield laid out a town at Stony Brook which they called Suffield, originally spelled Southfield. Though under Massachusetts jurisdiction, Suffield and Enfield were found to lie within the limits of the Connecticut Charter. Taxes were lower in Connecticut, the Charter gave the towns more freedom, and many of the people had come from that Colony. A secession movement began, in which they were joined by Woodstock. In 1749, the Connecticut General Assembly voted to receive these border towns. When the long boundary dispute was finally settled in 1804, Massachusetts was given the small area that makes a dent in the northern line of Suffield and Granby. General Phineas Lyman made his home here in 1743, became noted as a lawyer, and established what amounted to a law school. He gave distinguished service in the French and Indian War and died in 1775 while attempting the colonization of Mississippi. Dr. Sylvester Graham, born at West Suffield in 1794, was a dietary reformer to whom we owe the name "graham bread." Suffield consists of a fertile river plain, with a trap rock range on the western border. It was once a leader in the tobacco industry. Cigar making was introduced in 1810 by Simeon Viets, who hired a Cuban derelict to teach the local women how to roll them. The product was sold by peddlers, some of whom went into the cigar-making business themselves and acquired wealth. Shortly before the Civil War, improved methods of curing tobacco were introduced and cigar factories took the place of the older domestic industry.